House Blessing Mounted Print ~ $20 Looking for a most unique and inspirational housewarming, wedding gift or real estate closing gift? 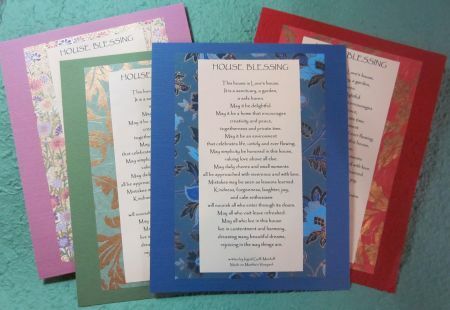 So many of you requested our House Blessing from the Good Mother, Welcome book that we mounted it on a variety of beautiful papers. 8 x 10, fits a standard frame. This house is Love's house. It is a sanctuary, a garden, a safe haven. that celebrates life, untidy and ever flowing. valuing love above all else. all be approached with reverence and with love. Mistakes may be seen as lessons learned. will nourish all who enter through its doors. May all who visit leave refreshed. rejoicing in the way things are.